August 11 is the 223rd day of the year(224th in leap years) in the Gregorian calendar.There are 142 days remaining until the end of the year. 3114 BC – The Mesoamerican Long Count calendar, used by several pre-Columbian Mesoamerican civilizations, notably the Maya, begins. 2492 BC – Traditional date of the defeat of Bel by Hayk, progenitor and founder of the Armenian nation. 106 – The south-western part of Dacia (modern Romania) becomes a Roman province: Roman Dacia. 355 – Claudius Silvanus, accused of treason, proclaims himself Roman Emperor against Constantius II. 490 – Battle of Adda: The Goths under Theodoric the Great and his ally Alaric II defeat the forces of Odoacer on the Adda River, near Milan. 1332 – Wars of Scottish Independence: Battle of Dupplin Moor: Scots under Domhnall II, Earl of Mar are routed by Edward Balliol. 1473 – The Battle of Otlukbeli: Mehmed the Conqueror of the Ottoman Empire decisively defeats Uzun Hassan of Aq Qoyunlu. 1675 – Franco-Dutch War: Forces of the Holy Roman Empire defeat the French in the Battle of Konzer Brücke. 1786 – Captain Francis Light establishes the British colony of Penang in Malaysia. 1804 – Francis II assumes the title of first Emperor of Austria. 1812 – Peninsular War: French troops engage British-Portuguese forces in the Battle of Majadahonda. 1813 – In Colombia, Juan del Corral declares the independence of Antioquia. 1858 – The Eiger in the Bernese Alps is ascended for the first time by Charles Barrington accompanied by Christian Almer and Peter Bohren. 1898 – Spanish–American War: American troops enter the city of Mayagüez, Puerto Rico. 1918 – World War I: The Battle of Amiens ends. 1920 – The Latvian–Soviet Peace Treaty, which relinquished Russia's authority and pretenses to Latvia, is signed, ending the Latvian War of Independence. 1929 – Babe Ruth becomes the first baseball player to hit 500 home runs in his career with a home run at League Park in Cleveland, Ohio. 1934 – The first civilian prisoners arrive at the Federal prison on Alcatraz Island. 1942 – Actress Hedy Lamarr and composer George Antheil receive a patent for a Frequency-hopping spread spectrum communication system that later became the basis for modern technologies in wireless telephones and Wi-Fi. 1945 – Poles in Kraków engage in a pogrom against Jews in the city, killing one and wounding five. 1952 – Hussein bin Talal is proclaimed King of Jordan. 1959 – Sheremetyevo International Airport, the second-largest airport in Russia, opens. 1960 – Chad declares independence. 1961 – The former Portuguese territories in India of Dadra and Nagar Haveli are merged to create the Union Territory Dadra and Nagar Haveli. 1962 – Vostok 3 launches from the Baikonur Cosmodrome and cosmonaut Andrian Nikolayev becomes the first person to float in microgravity. 1965 – Race riots (the Watts Riots) begin in the Watts area of Los Angeles, California. 1968 – The Fifteen Guinea Special became the last main-line passenger train to be hauled by steam locomotive power on British Rail . 1972 – Vietnam War: The last United States ground combat unit leaves South Vietnam. 1975 – East Timor: Governor Mário Lemos Pires of Portuguese Timor abandons the capital Dili, following a coup by the Timorese Democratic Union (UDT) and the outbreak of civil war between UDT and Fretilin. 1979 – Two Aeroflot Tupolev Tu-134s collide over the Ukrainian city of Dniprodzerzhynsk and crash, killing all 178 aboard both airliners. 1982 – A bomb explodes on Pan Am Flight 830, en route from Tokyo, Japan to Honolulu, Hawaii, killing one passenger and injuring 15 others. 1984 – "We begin bombing in five minutes": United States President Ronald Reagan, while running for re-election, jokes while preparing to make his weekly Saturday address on National Public Radio. A total solar eclipse occurs. A rare tornado strikes downtown Salt Lake City, Utah, killing one and injuring at least 100 others. It was the first tornado documented in Utah to result in a fatality since 1884, and caused $170 million in damages. A total solar eclipse occurred on 11 August 1999 with an eclipse magnitude of 1.029. A solar eclipse occurs when the Moon passes between Earth and the Sun, thereby totally or partly obscuring the image of the Sun for a viewer on Earth. A total solar eclipse occurs when the Moon's apparent diameter is larger than the Sun's, blocking all direct sunlight, turning day into darkness. Totality occurs in a narrow path across Earth's surface, with the partial solar eclipse visible over a surrounding region thousands of kilometres wide. The path of the Moon's shadow began in the Atlantic Ocean and, before noon, was traversing the southern United Kingdom, northern France, Belgium, Luxembourg, southern Germany, Austria, Slovenia, Croatia, Hungary, and northern FR Yugoslavia (Vojvodina). The eclipse's maximum was at 11:03 UTC at 45.1°N 24.3°E in Romania ; and it continued across Bulgaria, the Black Sea, Turkey, northeastern tip of Syria, northern Iraq, Iran, southern Pakistan and Srikakulam in India and ended in the Bay of Bengal. A tornado is a rapidly rotating column of air that is in contact with both the surface of the Earth and a cumulonimbus cloud or, in rare cases, the base of a cumulus cloud. The windstorm is often referred to as a twister, whirlwind or cyclone, although the word cyclone is used in meteorology to name a weather system with a low-pressure area in the center around which winds blow counterclockwise in the Northern Hemisphere and clockwise in the Southern. Tornadoes come in many shapes and sizes, and they are often visible in the form of a condensation funnel originating from the base of a cumulonimbus cloud, with a cloud of rotating debris and dust beneath it. Most tornadoes have wind speeds less than 110 miles per hour (180 km/h), are about 250 feet (80 m) across, and travel a few miles before dissipating. The most extreme tornadoes can attain wind speeds of more than 300 miles per hour (480 km/h), are more than two miles (3 km) in diameter, and stay on the ground for dozens of miles. 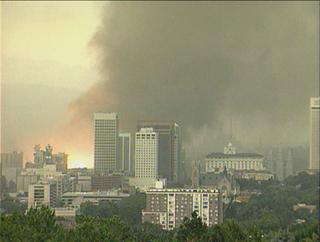 The 1999 Salt Lake City tornado was a very rare tornado that occurred in Salt Lake City, Utah on August 11, 1999. It was among the most notable tornadoes to hit west of the Great Plains in the 20th century and the second tornado to hit in Utah that resulted in a fatality. This was the sixth significant tornado in Utah since June 1963.It was also one of only two F2 tornadoes to have hit Salt Lake County since 1950. 2003 – NATO takes over command of the peacekeeping force in Afghanistan, marking its first major operation outside Europe in its 54-year-history. 2003 – Jemaah Islamiyah leader Riduan Isamuddin, better known as Hambali, is arrested in Bangkok, Thailand. 2006 – The oil tanker M/T Solar 1 sinks off the coast of Guimaras and Negros Islands in the Philippines, causing the country's worst oil spill. 2012 – At least 306 people are killed and 3,000 others injured in a pair of earthquakes near Tabriz, Iran. 2017 – At least 41 people are killed and another 179 injured after two passenger trains collide in Alexandria, Egypt. The 32nd century BC was a century which lasted from the year 3200 BC to 3101 BC. The Mesoamerican Long Count calendar is a non-repeating, vigesimal (base-20) and base-18 calendar used by several pre-Columbian Mesoamerican cultures, most notably the Maya. For this reason, it is often known as the MayaLong Count calendar. Using a modified vigesimal tally, the Long Count calendar identifies a day by counting the number of days passed since a mythical creation date that corresponds to August 11, 3114 BCE in the Proleptic Gregorian calendar. The Long Count calendar was widely used on monuments. The Pre-Columbian era incorporates all period subdivisions in the history and prehistory of the Americas before the appearance of significant European influences on the American continent, spanning the time of the original settlement in the Upper Paleolithic period to European colonization during the Early Modern period. 1950 – Steve Wozniak, American computer scientist and programmer, co-founded Apple Inc.
Year 1086 (MLXXXVI) was a common year starting on Thursday of the Julian calendar. Henry V was King of Germany and Holy Roman Emperor, the fourth and last ruler of the Salian dynasty. Henry's reign coincided with the final phase of the great Investiture Controversy, which had pitted pope against emperor. By the settlement of the Concordat of Worms, he surrendered to the demands of the second generation of Gregorian reformers. Year 1384 (MCCCLXXXIV) was a leap year starting on Friday of the Julian calendar. Year 480 BC was a year of the pre-Julian Roman calendar. At the time, it was known as the Year of the Consulship of Vibulanus and Cincinnatus. The denomination 480 BC for this year has been used since the early medieval period, when the Anno Domini calendar era became the prevalent method in Europe for naming years. Leonidas I was a warrior king of the Greek city-state of Sparta, and the 17th of the Agiad line; a dynasty which claimed descent from the mythological demigod Heracles. He was the husband of Gorgo, the daughter of Cleomenes I of Sparta. Leonidas had a notable participation in the Second Persian War, where he led the allied Greek forces to a last stand at the Battle of Thermopylae while attempting to defend the pass from the invading Persian army. Year 223 (CCXXIII) was a common year starting on Wednesday of the Julian calendar. At the time, it was known as the Year of the Consulship of Maximus and Aelianus. The denomination 223 for this year has been used since the early medieval period, when the Anno Domini calendar era became the prevalent method in Europe for naming years. Independence Day, celebrates the independence of Chad from France in 1960. Athracht is the patron saint of the parish of Locha Techet and Tourlestrane, Co. Sligo, Ireland. She was a sister of Bishop Conal of Drumconnell. Her feast day is August 11. Saint Clare of Assisi is an Italian saint and one of the first followers of Saint Francis of Assisi. She founded the Order of Poor Ladies, a monastic religious order for women in the Franciscan tradition, and wrote their Rule of Life, the first set of monastic guidelines known to have been written by a woman. Following her death, the order she founded was renamed in her honour as the Order of Saint Clare, commonly referred to today as the Poor Clares. Her feast day is on 11 August. January 8 is the eighth day of the year in the Gregorian calendar. There are 357 days remaining until the end of the year. March 22 is the 81st day of the year in the Gregorian calendar. There are 284 days remaining until the end of the year. November 10 is the 314th day of the year in the Gregorian calendar. There are 51 days remaining until the end of the year. September 29 is the 272nd day of the year in the Gregorian calendar. There are 93 days remaining until the end of the year. ↑ Ertel, Ivan D.; Newkirk, Roland W.; Brooks, Courtney G. (1978). "The Apollo Spacecraft - A Chronology. Vol. IV. Part 3 (1969 3rd quarter)". NASA History Program Office. NASA. p. 312. Retrieved October 24, 2017. ↑ Halm, Heinz (1991). Das Reich des Mahdi: Der Aufstieg der Fatimiden[The Empire of the Mahdi: The Rise of the Fatimids] (in German). Munich: C. H. Beck. p. 189. ISBN 3-406-35497-1. ↑ "Nobel Prize-winning author V.S. Naipaul dies at 85". 2018-08-12. Wikimedia Commons has media related to August 11 .